It’s early, of course, in the 2019 season but the New York Yankees, one of baseball’s favorites to win the World Series this year are looking very much like last year’s team, which fell short in the playoffs for one major reason. Their lineup of home run hitting sluggers was unable to put bat to ball when they faced top of the line pitching rotations like the Astros or the Red Sox. This season, so far, has that same feel, know what I mean? The Yanks’ lineup remains the most fearful in the game. From one through nine, a healthy Yankees’ batting order will do damage to most American League pitchers over the course of a season. Aaron Judge, Giancarlo Stanton, Gary Sanchez, Greg Bird, Luke Voit, Aaron Hicks, and Gleyber Torres will all hit more than 20 homers this year. Hell, they’ll all probably hit more than 30. The question is, how many of these bashers will also hit .280 or better and strike out less than 100 times? The Yankees dilemma this year is the same as it was last year. Hitting homers in batches, as the Bombers did in 2018 (266 – a major league record) puts fans in the seats, even bringing back the early-arrival fans who enjoy watching these very large men take their pre-game batting practice hacks but, it doesn’t win championships. But, who are the table-setters? Nothing wrong with power, in this age of weight-training, protein drinks, and any other enhancements used in professional sports. But, even in 2019, championship teams must possess lineups that include a smattering of hit-to-contact types so the bashers can get big, sweet fastballs to swing at with runners on base. Opposing pitchers prefer to pitch off the plate to big swingers, who tend to feast on fastball strikes but without ideal bat control, can be fooled by pitches that expand the strike zone to include breaking balls in the dirt. Base runners force pitchers to throw strikes, a good scenario for big swingers like Judge and Stanton and Sanchez. The Houston Astros’ second baseman, Jose Altuve, has, at 5’6″, 160 pounds made himself into a superstar by getting on base, not striking out, and making opposing pitchers jittery when he’s taking leads off first. The Red Sox have Mookie Betts, who also knows how to make contact and does so to all fields with power, despite his diminutive body-type. Guess which teams won the past two World Series? If you answered the Astros and the Red Sox, you’d be right. I’m not saying the Yankees should have held onto a popular player of theirs from the past two seasons, Ronald Torreyes, but let’s just say, by getting rid of a “Torreyes-type,” they no longer have a diminutive contact hitter in their lineup who rarely strikes out. Brett Gardner is going to be 36 during this season, and never was a hit-to-contact type with a high on-base percentage. Tyler Wade has a lifetime batting average of .164. D.J. LeMahieu, a solid acquisition during the off-season, doesn’t fit the profile of an Altuve or a Betts, either. Yesterday, the Yankees beat the lowly Orioles, 8-4. Their offense, third in the American League in strikeouts and at the bottom of the league in stolen bases, has been slumping for several games now. Once again, the Yanks were in their collective offensive funk against Alex Cobb, the Orioles starting pitcher who will NOT be in the running for the Cy Young award, until the sixth inning. Cobb was treating this Yankee lineup as if he was pitching for the Astros or the Red Sox, in post-season games. Baltimore, on paper the worst team in the sport, had a 4-1 edge going into the sixth inning, the Yankees lone run coming on, you guessed it, a home run by Gleyber Torres. Other than that, against Alex Cobb, zilch. It wasn’t until the sixth inning when the pinstripes exploded against the putrid Orioles bullpen for four runs, on, yes, a solo home run by Sanchez and a three-run homer by Torres, his second of the game, coming after two singles by Bird and LeMahieu. Here’s the thing about home runs. They come in bunches and practitioners of the art of home run hitting tend to be streaky. They will hit 10-15 in a month, then, nothing but ground outs and strikeouts for a few weeks. Nobody seems to know why that is. It’s one of baseball’s mysteries that keeps this game interesting. But, it doesn’t help a team when most of its lineup is comprised of precisely those kind of bashers who have their hot and cold streaks during the season, but are especially cold during the playoffs, when the strikeouts and ground outs are almost a guarantee. Note to Yankees’ General Manager, Brian Cashman: The Yankees will not win a World Series without scrappy, speedy guys with high on-base percentages to set the table for their sluggers. 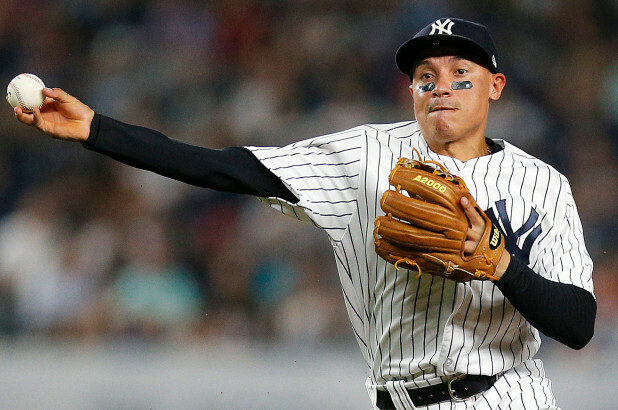 Where have you gone, Ronald Torreyes?